Tenkara, simple fly fishing method from Japan, uses only a telescopic tenkara rod, tenkara line and tenkara fly: Japan Revisited – In Search of Tenkara? Japan Revisited – In Search of Tenkara? Tomorrow morning I will be heading to Japan for my 4th visit. It is part of a journey I have so far called “my search for tenkara”. On my first visit I discovered the method (and as a result decided to introduce it outside of Japan). My second visit served to learn the techniques and what makes tenkara a complete method. The third visit, 2 months spent in a mountain village, allowed me to dive deeply into tenkara. I have met, interviewed and fished with several of the long-time masters of tenkara, learning directly from them what tenkara is. I also spent time with some of the so-called “3rd generation” of tenkara anglers, young tenkara anglers that have been pushing the sport forward (albeit in much subtler ways than what we may see here). As I prepare my suitcase and finalize my schedule, I have to ponder, what else is there to seek? What else can I learn about tenkara? What are the things that would be of interest to the readers of this blog? Although what I learn and share about tenkara can be seen as a “business”, this trip like all others are part of a personal journey. Everything I do, I do because it interests me greatly on a personal level. What I experience, what I learn, and what I capture are as much for my own enjoyment and self-enrichment as for sharing. I visit Japan and fish with long-time practitioners of tenkara because I like sharing tenkara as it is practiced in its country of origin. I am not good at inventing new things, tinkering with accessories, or making up a new method. I much prefer to tell a story, and to share what is waiting to be shared. I have scheduled time to fish and spend time with teachers and friends. I have also scheduled time to visit tenkara rod makers, tenkara line suppliers, and even tenkara fly tiers. I have also scheduled time to simply fish. And, finally, I have made sure I have time that is not scheduled, which will allow tenkara to take me where it will. I’ll try to share as much as I can throughout the trip. As I prepare to embark on this trip, I have to ask you, what are the things you’re most interested in learning? Seeing? Reading? 18 Responses to Japan Revisited – In Search of Tenkara? 4. If you could get video of some masters casting or giving tips, that would be awesome. I would love to see pictures of the various handmade fly boxes, line holders, nets that may be unique. Seeing one of a kind items that someone has put alot of time and effort into creating is very relaxing to look at. Craig, will certainly look for them. Thanks for the input. I am curious about whether fishing with a pole and fixed line has spread to parts of Japan in which there are lakes but no mountain streams. I am curious how people fish for the Japanese equivalents of bass and panfish in those non-tenkara (no mountain stream) areas parts of the country. Perhaps they use fly tackle. Perhaps spin gear. Perhaps fixed line pole fishing. I am curious. If they use fixed line or fly tackle, what flies and bugs are popular? If fixed line, do they use floating line? The reason I am curious is because perhaps some of us non-Japanese could learn something from the Japanese in addition to pure, mountain-stream tenkara. Enjoy yourself and continue to enrich your life. Sayonara until your return. Paul, fishing with a fixed line for fish other than trout is VERY common in Japan. They have “Hera” for carp, “tanago” for “micro” fish, etc. Not really with flies. Will see if I find some people doing it and will talk about the different methods. for me I find your trips fascinating not just because you will have some new fishing secrets to share but mostly because of all the things that surround tenkara culture in Japan and dont have anything specifically to do with it. my only request would be to take lots and lots of pictures and videos, for me that’s what spawns the questions that I may not be able to think of on my own. Thanks Matt for the comment. Really appreciate the feedback and will try sharing more of that. I envy you for I am fascinated by the Japanese culture and way of life. Since I am only days away from 70 years of age it is probably too late for me to think of spending a year or two in Japan like I would dearly love to do. I would love to see some emphasis on Tenkara fly tiers plus perhaps a peak into home interiors of fly fishers, especially in the rural areas beside the mountain tenkara streams. Enjoy your time there, Daniel, and may it turn out to be all you would want it to be. — And, I am thoroughly enjoying my new Ayu rod and new-found Tenkara fly fishing. Will certainly try getting more on flies and tiers. Have a good time Daniel. My question is to find out what different individuals in Japan define as their Tenkara. For instance my Tenkara is being out in the beautiful places feeling the calm and awe of nature while fishing. Listening, exploring and seeking out all the creatures found in and around the water. It is a question I intend to ask, though I’m pretty sure the answer is already found throughout this blog. I am surprised to learn that there is no fixed-line fly fishing, or perhaps I misunderstood your response. Surely they have game fish other than trout, and surely there are people who use flies to catch them; one just assumes they would find the same fun with fixed-line fishing for warm-water species that is enjoyed elsewhere in the world. I’ll be very curious to read a report on that. Are there any Tenkara guides in Japan? I recently got a Tenkara rod (from Japan) but have not hade the possibilty to try it i Sweden (due to off season). I will go on a work trip to Japan in february and would like to test the rod when I`m there. I have searched for Tenkara guides in Japan but without success. Have you got any tip? 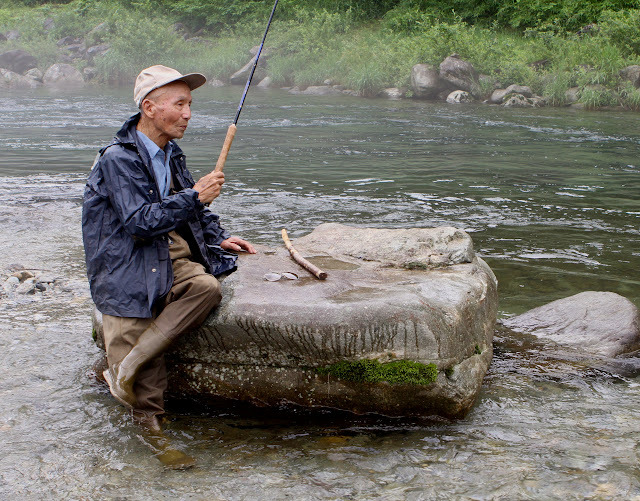 There really are not many fishing guides in Japan, some but not a whole lot. But, keep in mind that unfortunately the fishing season is all but closed in Japan in February. There may be a few streams in all of Japan that allow fishing at that time of year, but they are very few and far between. How long will you be there? I will be in Tokyo/Ageo during the working days an will have the weekend free. I will probably only bee there for one week. I’ll contact a friend of mine who teaches tenkara and is not far from there and see what he says. But, as a heads up, don’t think there is much fishing at that time. I see it as a great bonus if will be any Tenkara fishing or close to it.